famous restaurant in Orlando, Florida. 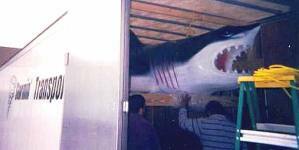 Specialized Loads - including Great White Sharks! Is fully licensed and insured with $100,000 cargo insurance. Welcomes multi-stop loads, truck load and LTL, also drop trailers. Utilizes late model equipment including air-ride 53' vented dry vans. Offers blankets, straps, load bars, and pallet jacks, with driver assist as necessary. Has professional courteous drivers fully equipped with state-of-the-art communications. Because we believe the success of our business is and always will be a combination of... the finest quality professional drivers, on-time and damage free deliveries, late model equipment and effective communication... which all add up to - EXCEPTIONAL CUSTOMER SERVICE! Contact Sheri for a quote Today! Moving your business in the right direction!